Musical key characteristics are something that are never talked about for some odd reason. It's not like professional songwriters choose a random key and slap some random chord changes in there and magically end up with the perfect feeling that matches the lyrics. It's not some hidden secret. I can almost guarantee you most songwriters think "Is this a positive emotion or a negative one?" If it's positive they know they're going to use a major key and if it's negative they'll use a minor key. After that, unless you're a super experienced musician you're going to rip the key off of some other song you know or you'll consult a list. Well here's your list! We're going to help you match the tone and psychological effect that you want your song to have to a specific key so it's not a wasted effort. Unless you're going for some crazy juxtaposition effect, just find the feeling you want out of the list below and get to work! 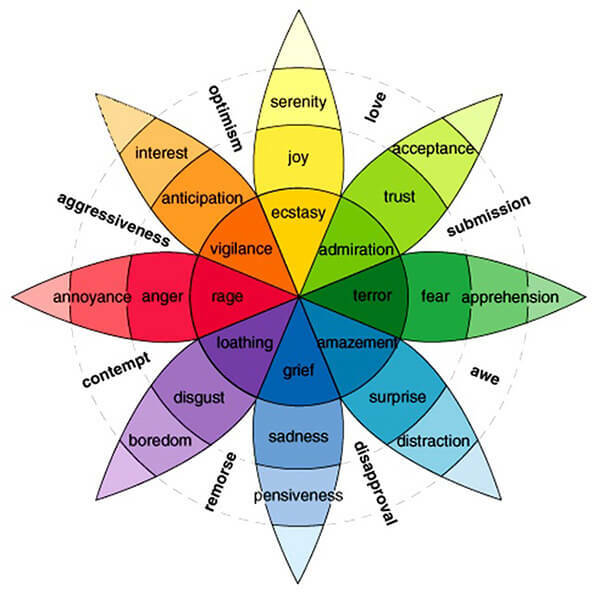 Everyone knows about the base emotions, and most people use certain other words as if they're synonyms for the base emotions. But their not. They are subtle explanations of how specific base emotions combine to create more complex feelings. Being able to internalize all of these words and understand the deep richness they can conjure up can help expand the reach of the power of your music. But you don't want to just add these words to your lyrics. That won't do anything. You have to touch people's hearts and minds. You have to create an atmosphere that conjures up their own experiences and memories. And you do this by choosing the proper musical key that expresses the characteristics of those emotions. Below we list every commonly used key, major and minor, along with a succinct version of their emotive expression and also include a more verbose explanation so you can really dig deep for what you're looking to get across to your listeners. A quick way to find what you're looking for is to use your browser's find (search) function. Also, b is used to denote flat while # is used to denote sharp. There may be some contradictory emotions, showing that the key can be used to describe a range of polar topics. Completely pure. Simplicity and naivety. The key of children. Free of burden, full of imagination. Powerful resolve. Earnestness. Can feel religious. Declarations of love and lamenting lost love or unhappy relationships. It is languishing and full of longing, a soul in search of something different. A passionate expression of sorrow and deep grief. Full of penance and self-punishment. An intimate conversation with God about recognition of wrongdoing and atonement. Rapture in sadness. A grimacing key of choking back tears. It is capable of a laugh or smile to pacify those around, but the truth is in despair. Fullness of tone, sonority, and euphony. Screaming hallelujah's, rejoicing in conquering obstacles. War marches, holiday songs, invitations to join the winning team. Melancholy, feminine, brooding worries, contemplation of negativity. Dealing with anxiety and existential terror, deep distress, dark depression. The dark night of the soul. Fear, hesitation, shuddering, goose bumps. The language of ghosts. Love, Devotion, Intimacy, Openness, Honest Communion. Conversations with God. Shouts of Joy, Complete Delight, yet Bickering, Short-fused, Ready to Fight. This key can carry grief, mournfulness, restlessness. Like a princess locked in a tower longing for her rescuer and future lover. Complaisance, Controlled calmness over the readiness to explode. Deeply angry but composed and sociable still. Religious sentiment. Deepest depression, lament over death and loss, groans of misery, ready to expire. Harrowing. Melancholic. Triumph over evil, obstacles, hurdles. Surmounting foes and finally finding rest in victory. Brilliant clarity of thought and feeling. Tearing at your hair and shirt, discontentment, long periods of lamentation and crying. Still capable of fighting this feeling. Rustic, Idyllic, Poetic, Lyrical. Calm and satisfied. Tenderness and Gratitude. Friendship and Faith. It is a gentle key full of peace. Worry of the future, of a failed plan, gnashing of teeth. Concern over a failed plan. Struggling with dislike and malcontent. Putrefaction, Expansive viewpoints of a dark cosmos and existence. Ghosts, Ghouls, Goblins, Graveyards. Haunting and Lingering. Suffocation of the Heart, Lamentations, Life-Long Struggles. A negative look at the experiences of life, competition, growth. Innocent Love, Satisfaction with the current state of affairs. Optimistic. Belief in Heaven and reuniting with lost loved ones. Youthful and cheerful. Trusting in the spirit of the divine. Womanly, Graceful in character. Capable of soothing. Love, Clear Conscience, Hopeful Aspirations for the future and a better world. Optimistic and able to take control in order to ensure peace. The Garment of Night, Surly, Blasphemous, Turning away the world and the divine. Preparations for the end. Pessimism and giving up. Belief in darkness. Uncontrolled passions. Angry, Jealous, Fury, Despair, Burdened with negative energy. Prepared to fight. The key of patience, calmly waiting for fate, destiny, and the submission to providence and karma. If you're happy with your choice of musical key, now it's time to figure out which chord progression you want to use to further accentuate the feeling you're aiming for. Check out our post on chord maps for an easy shortcut on that!